20 минут на автомобиле от города Уэда до Камиямада Онсэн. 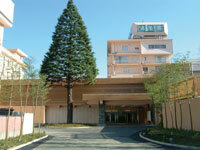 Hotel Seifuen is a luxury, quiet and elegant hotel located along River Chikuma in the center of hot spring resort. It is surrounded by green garden in the big site. The hotel has many types of rooms as Japanese, western and Japanese-western style. 40 minutes on bus from JR Ueda Station bound for Ueda Kanko Kaikan and get of at Seifuen. 7 minutes by taxi from Shinano Railway Togura Station. 15 minutes drive from Koshoku Interchange on Nagano Expressway via route18.